Soap & Glory Glam A Lot Body Spray - I love the scent of this and wish they sold it as a perfume as the body spray just doesn't last that long. I use this when I'm just going to the shops or something when I just want a subtle scent. Although I'm not 100% sure I think it's a mix of musk, sandalwood and vanilla. I'll definitely be buying this again when the other S&G body spray I'm using has ran out. 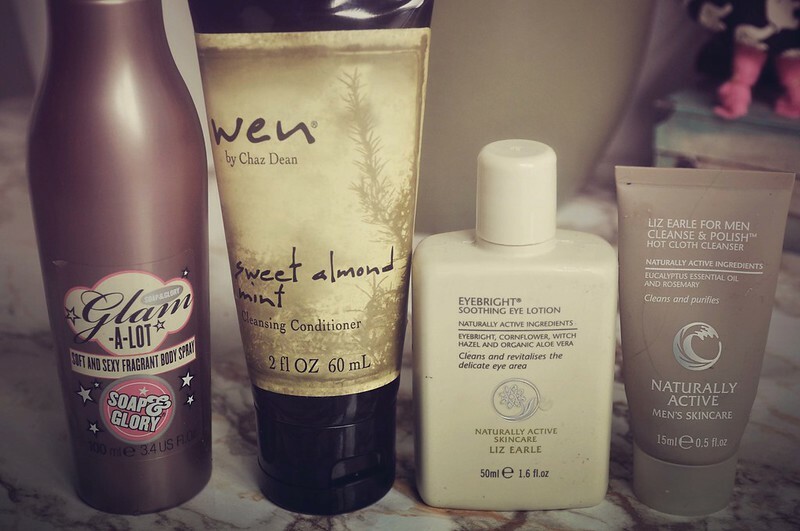 Wen Sweet Almond Mint Cleansing Conditioner - This came in last months Joliebox and I have to say I didn't use it instead of shampoo and conditioner as you're meant to. I used it as my conditioner and while it was nice it's not something I'd buy properly. Liz Earle Eye Bright - I've gone through so many of these I've lost count. It's the best eye make-up remover I've tried and also makes a great quick treatment if my eyes are irritated with hay fever. I'm using a different remover at the moment but once I run out of that I'll be buying another one of these. Liz Earle Cleanse & Polish - I found this little tube of the mens C&P in the bathroom cupboard and I knew my dad wouldn't finish it so I thought I would. As far as I can tell it's the same product just in different packaging. Again I've lost count of how many tubes of this I've gone through! It's my holy grail cleanser. Balance Me Rose Shower Gel - This little bottle was in one of my Latest In Beauty boxes. It smells lovely but isn't as moisturising as the Weleda rose body was which I love so I wont be buying the full size of this. 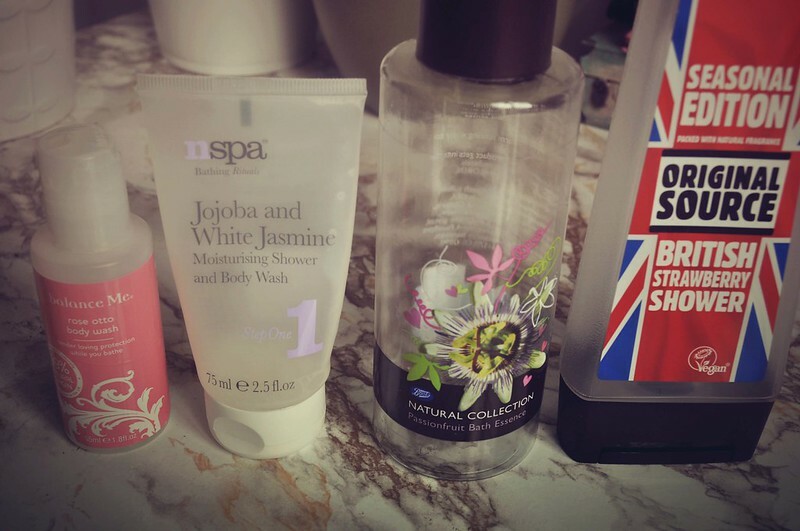 Nspa Jojoba & White Jasmine Body Wash - This is one of my favourite shower gels. The product itself is pretty standard but the scent is amazing! If you have an asda near you then you need to smell this range. I've already bought the full size. Natural Collection Passion Fruit Bath Essence - To me, this doesn't smell like passion fruit at all although it is nice and fruity. For a cheap bubble bath it works great and I'll definitely buy it again at some point. Original Source Strawberry Shower Gel - This is another one were the product itself is standard but it smells amazing. The strawberry scent is so strong that it makes you want to eat it. The limited edition scents are always the best like the pineapple one they brought out last summer. I think it's still available though so I'll be picking up another tube. Been browsing through your blog for the last twenty minutes, I love your taste in products and style! I have always wanted to try the Liz Earle cleanser but I'm hesitant to order it online. I also have heard lots of great things about Wen, but never got around to purchasing anything.